Fire-Safe Chimney Sweeps is a fourth generation family business operated by Master Mason, Gary Clift, and sons. If you’re searching for a reliable Dayton chimney sweep, we are the most experienced, full-service chimney company in Maryland. When you call us for service, you can rest assured that we will take the utmost care of your property in order to perform our work, will be on time, and will offer the fairest value for our services. We build, install, and service chimneys, wood burning stoves, and fireplaces all over Howard county including Glenwood, Cooksville, Laytonsville, Sunshine, Olney, Highland, Clarksville, and Woodmark. Dayton has hot and humid summers and cool winters with highly variable seasonal snowfall. Due to its elevation and distance from the Chesapeake Bay, temperatures in Dayton are often considerably lower than in eastern parts of Maryland, especially at night. Frequent freeze-thaw cycles, higher than average snowfall, and more frequent use of fireplaces in Dayton means Dayton chimneys often require service more frequently than in other areas of the region. If you notice cracking of your chimney crown, crumbling mortar, funny odors, or debris in your fireplace, call Fire-Safe Chimney Sweeps today for an inspection and cleaning. We can diagnose and repair any maintenance issues to keep your chimney and fireplace burning safely and trouble-free. 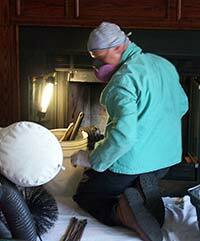 Unlike many chimney firms who send out unskilled laborers, Fire-Safe sends a Master Stone Mason—our owner—on every job. Fire-Safe Chimney Sweeps is proud to serve Dayton in providing decades of chimney construction experience. Our 4th generation family business (owned and operated by Master Mason, Gary Clift, and sons) has been building, cleaning, and repairing chimneys since 1863. We can work independently or with your architect or builder to achieve the chimney style and color that you desire. There are many factors that affect the chimney construction process including available brick or stone, grout colors, permitting, construction time, site conditions, etc. Fire-Safe Chimney has successfully managed this process for over 75 years. We are the most experienced chimney firm serving Dayton, Maryland. Did you know? The Dayton postal office operated from July 21, 1864 to present with only brief stops in service during the American Civil War. By 1878, Dayton had expanded to three general stores and a wheelwright shop. Maloney’s General Store, built shortly after the Civil War, served as a stagecoach stop and was later owned by Royal Harp III, Thomas Isaacs, Mr White, and the Grant Family. Dayton’s two room school house once located along Green Bridge Road is now on property owned by RLO Contractors.